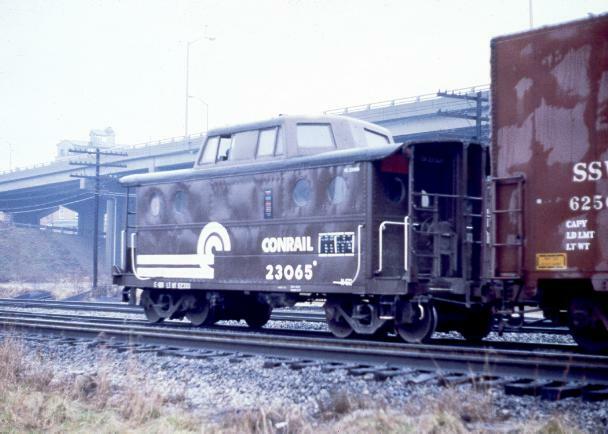 CR 23067 at New Carrollton, MD in April 1979, three years after the formation of Conrail. CR 23175 at Harrisburg, PA.
Photo by T.W.Wolfgang 59k CR 23130 at Warner Yard in Monroe, MI on 4/19/97. 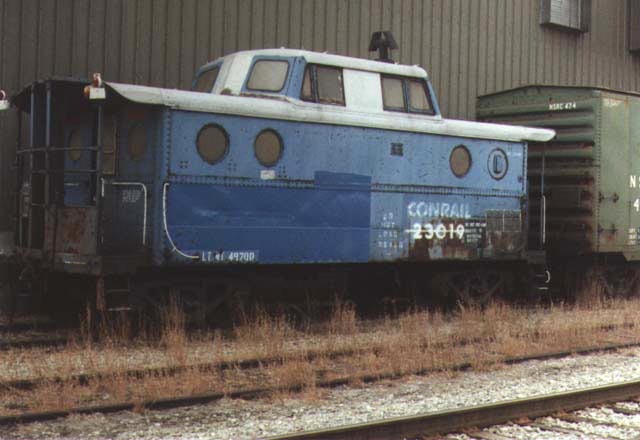 CR 23065 is one of the N-5Cs that was painted brown for PP&L unit train service. Photo by Charlie Bowyer 43k 19 years later...in use on the local between Rockport yard and the ex-EL yard on E. 55th St, Cleveland on March 15, 1997. 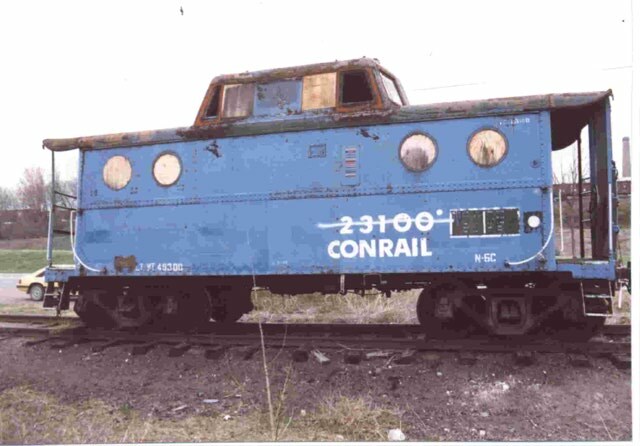 N-5C 23077 at CP Belt in Reading, PA last week of January '97. 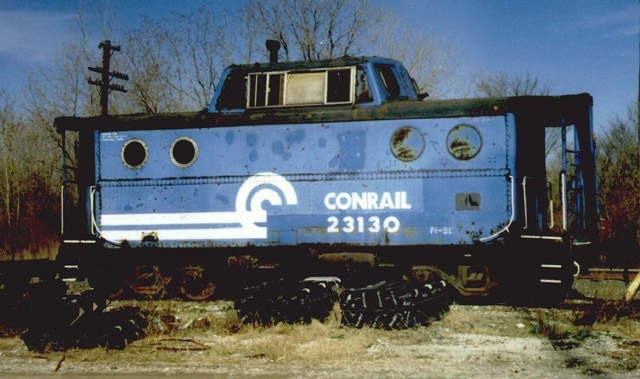 I'd hate to be on a crew trying to restore this one! 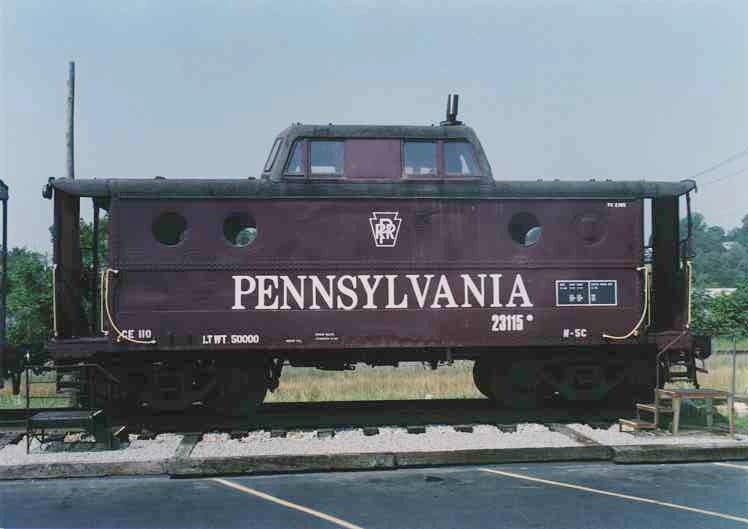 Photo by Bob Waller 95k 'PRR 23115' ex CR N-5C 23115 at Derry, PA . The restoration crew should have at least backdated the number! PRR 477947 in the new portion of the Railroad Museum at Strasburg, PA. This car is in good shape and the interior is open for viewing. Unfortunately for the museum the cupola windows on this car had been modified and the trucks replaced with roller bearing types. And while I'm picking nits it would be nice if there was a train phone antenna! Photo was taken in August, '97. 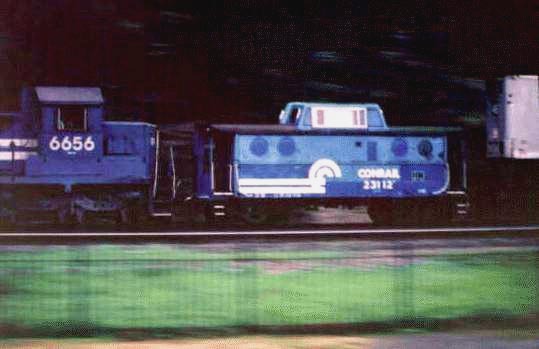 It's hard to believe that CR 23100 and PRR 477951, in the center, are the same car! The Cumberland Valley Chapter, N.R.H.S. in Chambersburg, PA group did an excellent job on this N-5C. The car is on display at the visitors center at the junction of I 81 and US 30. Two photos by Jim Hermsdorfer, 68k and 95k respectively. 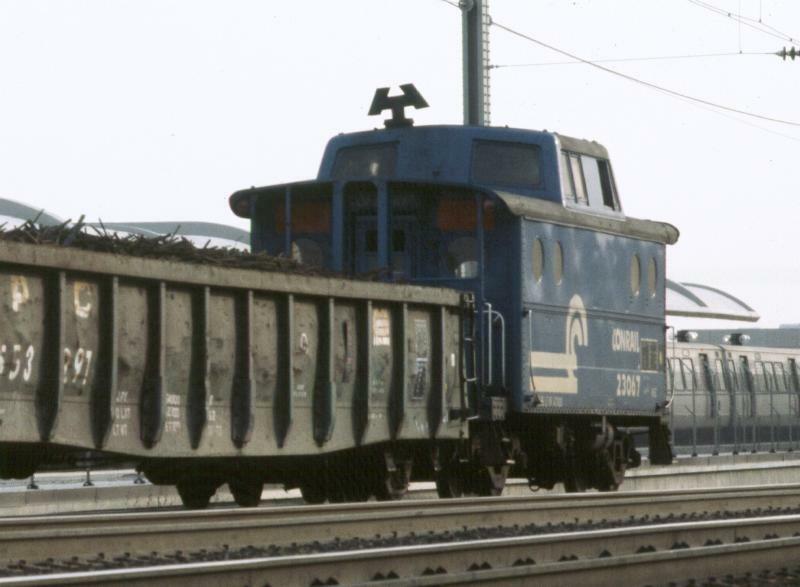 The photo on the right shows the underframe detail, note the bolster design unique to the PRR N-5x class cars. Photo by T.W.Wolfgang, 52k. CR 23019 ex PRR 477954 at Gorham NH fall '91 or spring '92. This car is owned by the Gorham Historical Society. Take a look at the right hand photo to see its new paint job. The restoration work and paint job look excellent, if unprototypical. I doubt any N-5Cs ever carried a the Maple Leaf herald in service! (I'll post otherwise if proof is shown) The silver paint shows off the modern trucks on this classic car. The photo was taken in January 1994. Both photos by Tom Mahon, 45k and 54k respectively. 169 cars 23000-23179 ex PC 23000-23173, 23325-23332 ex PRR 477820-478019. 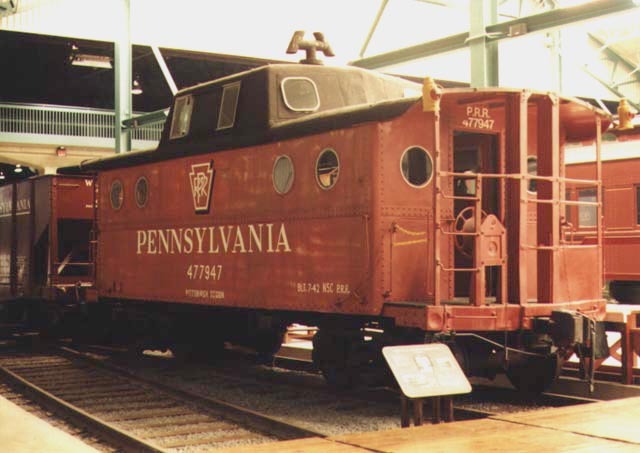 Classic Pennsy round window caboose. Built 1942. 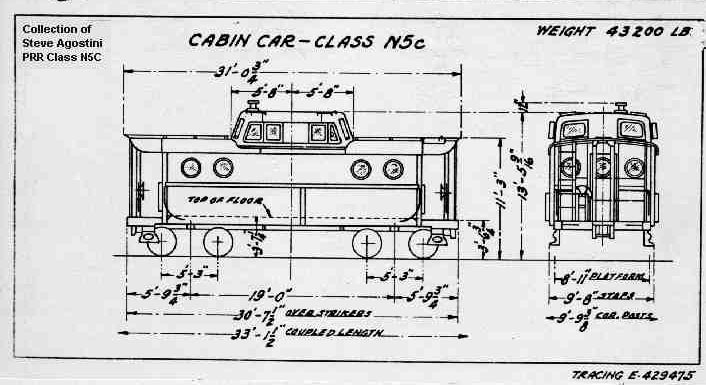 The dimensions were the same as the N-5Bs with the addition of a large streamlined cupola and paired porthole windows on the sides. 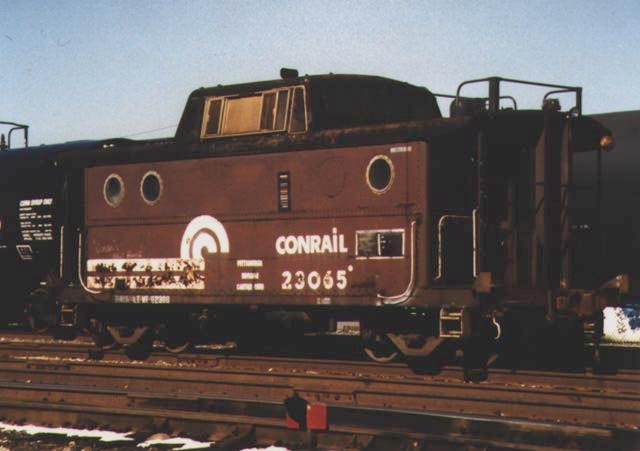 Four N-5Cs were painted very dark brown for use on PP&L unit trains, 23065, 23070, 23091 & 23120, it was originally planned to do 10. This is your webmaster's favorite class. Outline created from Bowser model by T.W.Wolfgang. Bowser makes an excellent model of this classic car. Most cars had roofwalks removed, ladders cut down and a plate installed on the right side of the end platform. The trucks supplied in the kit are incorrect for modern cars and should be replaced with a leaf spring type with journal or roller bearings. 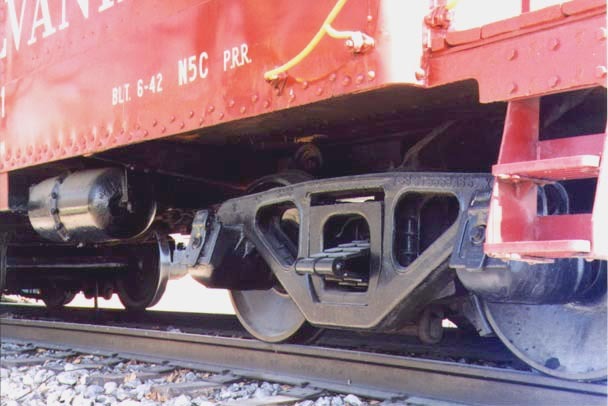 These larger trucks will require the steps to be moved outward, the cast parts that come with the kit should be replaced with a fabricated part. 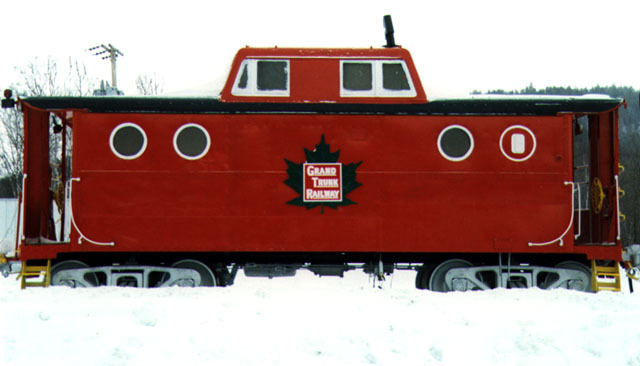 Lionel produces a 'toyish' version, probably the reason that my favorite is the N-5C, it was my first caboose. Currently available in PRR colors only. Quality Craft Models produced an etched brass kit in N scale, I don't know if it is still available. I built one, it was quite a challenge. 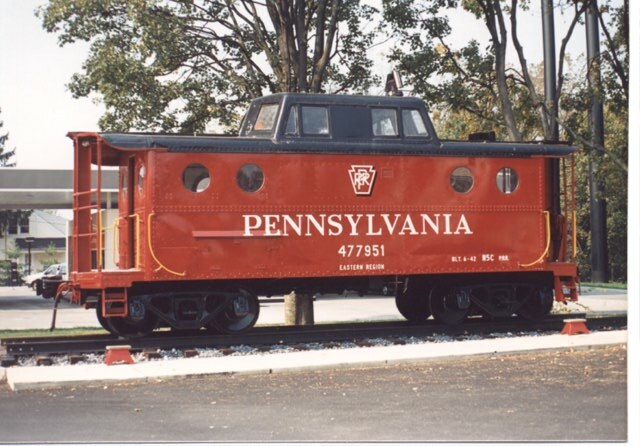 Kitbashing Pennsy Cabin Cars", James McHenry, Model Railroader Apr. 82, Pages 79-81. 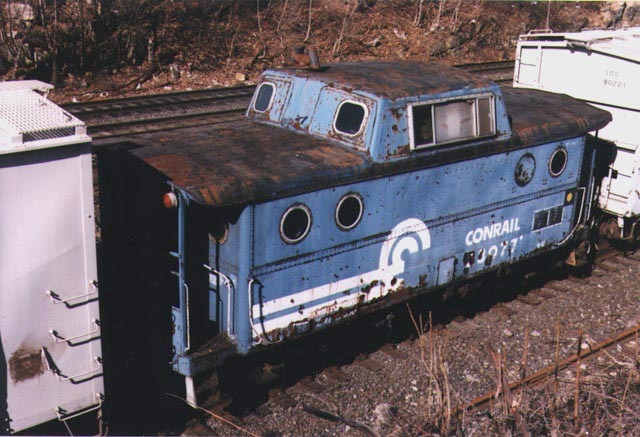 This article is from the days before the Bowser model, a Tyco and MDC caboose are used to create a good model of an N-5C. 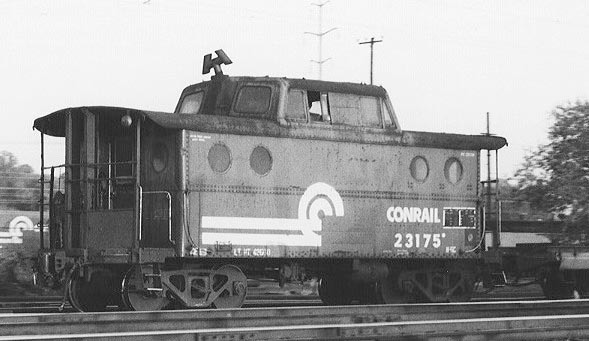 PRR 477880 with train phone antenna, b&w. 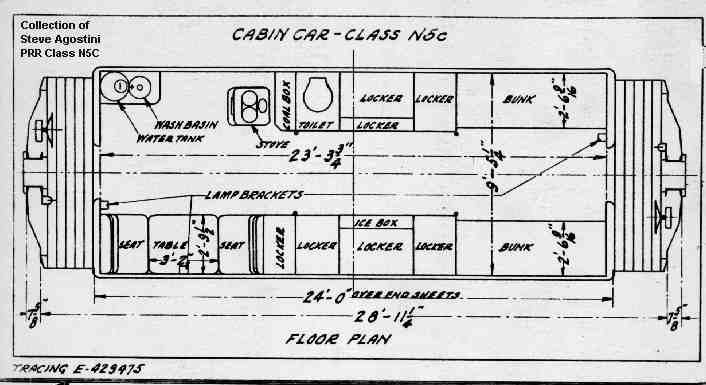 "Modeling the N5C Cabin Car: Post March 1 '68 Part 2", Jim Six, Model Railroading Jan. 93, Pages ?? Part 1 dealt with PRR exclusively. Fantastic article in Six style covering PRR, PC, & CR N-5C's. photos ?? I don't have a copy of this article.